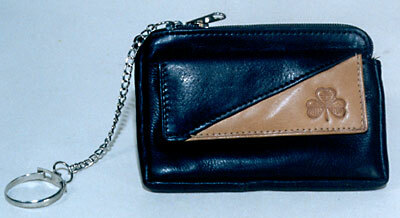 Description: A leather key case with a triangular design on the small coin pocket. The size is 7.5 x 11.5 cm. The top pocket is closed by a zip with two runners. To one runner is attached the key ring holder. The front has a small pocket for coins. The model can be made in different types of leathers like Cow Polished, Cow Nappa, Cow Vegetable, Buff Resin, Buff Glazed, Buff Vegetable and Cow Softy. The colours available are black, blue, brown and shades of cognac and burgundy.